Today's SRC post comes from Ashley at Rainstorms and Love Notes. I was excited to get her blog this month because I haven't had a chance to blog in a while (ya know, with a newborn and all), so finally getting online and checking out the abundance of yummy recipes Ashely had lined up made me even more excited to get in the kitchen and make something new. I love strata recipes because they're kind of like a glorified french toast…without all the extra work, of course. 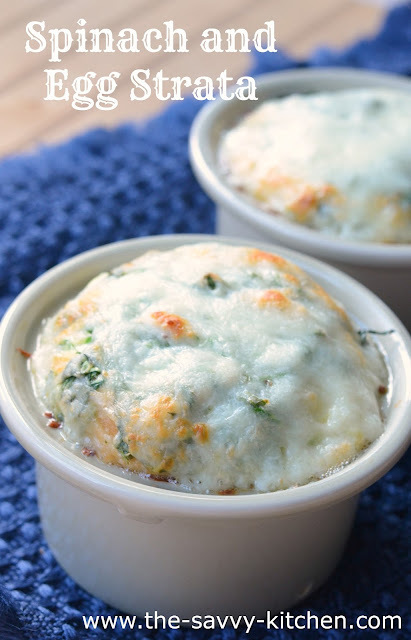 You throw the bread and milk into a ramekin with yummy spices, add some spinach for extra flavor and texture, and then top with delicious Mozzarella cheese. A super simple breakfast that is packed with flavor (and vitamins) and will keep you full until lunchtime. Enjoy! Tear the bread into small pieces and divide evenly in the ramekins. Chop the spinach and place on top of the bread. Whisk together the eggs, milk, garlic, oregano, salt, and pepper. Pour the milk mixture evenly over the bread and spinach. 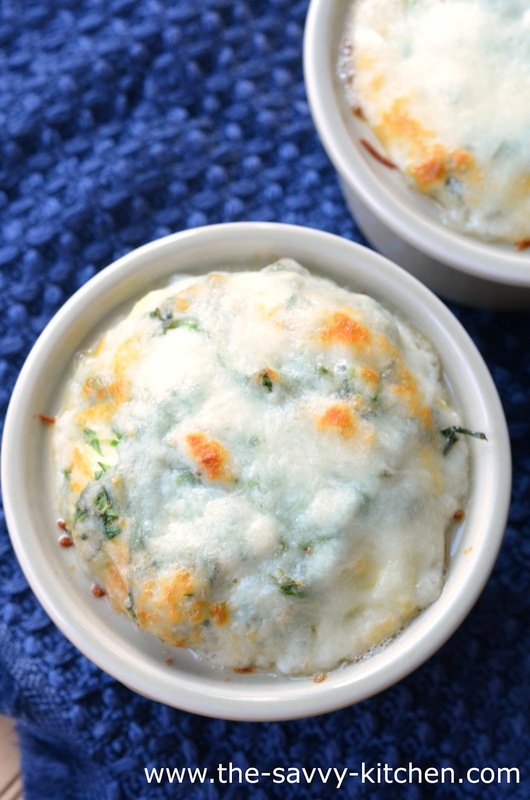 Top with the cheese, cover with foil, and bake for 20 minutes. Remove the foil and back for another 15 minutes, until the cheese is starting to brown.